Sometimes Yahoo Video gives this error: Sorry! This video is no longer available on Yahoo Video. In this case refresh your browser a couple of times! I have been watching various video lectures for almost 4 years now. 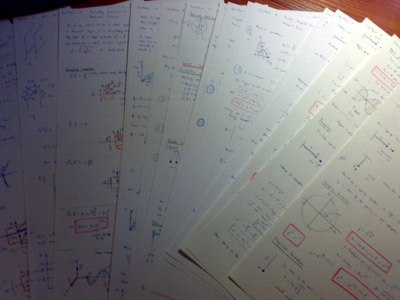 Mostly mathematics, physics and theory of computer science. My approach to getting most of the lectures is the following. When I watch the video lectures I take notes just as if I were in class. Even better, when I do not understand a part of the lecture I can always rewind it back and see that fragment again. I can also pause the lecture, think for a while and then continue. Here is a photo of notes I too while watching MIT's 803 – Vibrations and Waves. 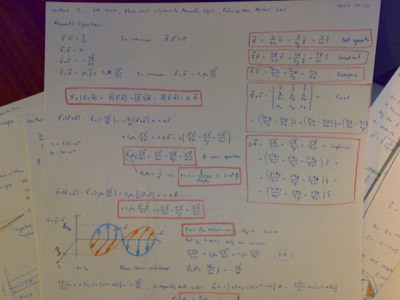 I am serious about physics and maths video lectures, as you can see in the image, all the main results are boxed in red, the results are fully derived (even if the professor does not do it on blackboard). Btw, one lecture perfectly fits on both sides of an A4 sheet. Here is a close-up of Lecture 13: Electromagnetic Waves - Plane Wave Solutions to Maxwell's Equations - Polarization - Malus' Law. This approach probably does not work with programming languages and computer tools. Because mathematics and physics is mostly done on paper, watching these video lectures and taking notes is actually doing them. The process of taking notes develops the skills because you work with the new concepts, operators, theorems, and other math terms. Not so in programming languages. You can read a book on a new programming language and you won't even be able to write the hello world program because you have only got familiar with the subject and have not developed the skills. I have experienced this myself. I will definitely watch all 11 video lectures. I will start with the first four basic lectures, watch them one by one, take notes as with physics video lectures and experiment as I go. I will be taking notes lightly to have my mind really think the information I am getting over. But no red boxes around constructs as with physics. That's the experimentation part to learning. I am going to try the new constructs as soon as I see them so they stuck in my mind better. Update: I dropped the idea of taking any notes on paper, because I am blogging the key points from lectures here. Also to make this article interesting, I will annotate each lecture if something really interesting catches my eye. As I mentioned, I have programmed JS before so I am not sure how much I will learn from the first four basic lectures. (22:59) The language is loosely typed but not "untyped"
(30:16) The bitwise operators convert the operand to a 32-bit signed integer, perform the operation and then turn the result back into 64-bit floating point. Don't use bitwise operators in cases like multiplying by 4 using << 2. It will not. After having watched the first lecture I decided that there was no point in taking notes on paper because I am blogging the key points here and trying various examples I can come up with with JScript, taking notes just wastes time. After watching this lecture I decided to add time where each point that caught my attention happened so that if anyone is interested in any of the points he/she could just fast forward to that place in the video. Eventually I will go through the videos up to this one once more and add timestamps. (14:50) Microsoft does not send an event parameter, they use the global event object instead. (11:20) Internet Explorer 1.0 identified itself as "Internet Explorer" but many sites refused to serve the contents complaining that it was not "Mozilla" so in version 1.5 IE identifies itself as "Mozilla"
(18:48) No browser completely implements the standards and much of the DOM is not in any standards. If there was a 100% standards compliant browser, it would not work! (28:05) "Parasitic inheritance" is a way of creating an object of an augmented version an existing object. There are not that many interesting points anymore because most of the stuff has been covered in the previous lectures. Apart from that these lecture did not teach me much new because this stuff was pretty obvious. The only point to watch this lecture is to refresh all these obvious suggestions - agree on indentation and naming conventions in your team, comment difficult algorithms and large sections of code, don't write obvious comments, comment hacks, loose coupling, careful use of complex code and design patterns, etc.